The Vodafone national football side started its campaign in the first match of the 3-Nations FIFA International Friendly beating New Caledonia 3-0 at the ANZ Stadium in Suva on Monday night. Captain Laisenia Raura will miss the second match against Mauritius on Sunday after given the marching orders in the 80th minute for a scuffle with New Caledonian players. Strikers Samuela Drudru and Rusiate Matarerenga scored goals for the Christiphe Gamel coached side. 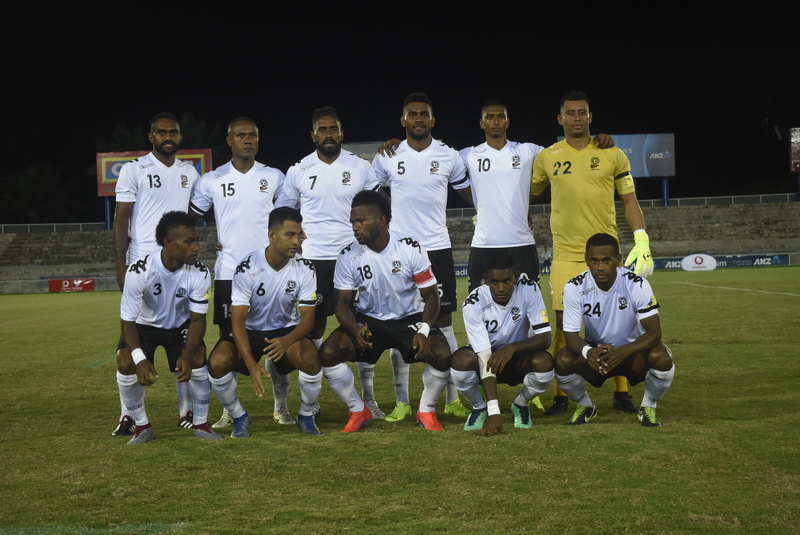 Drudru scored Fiji’s opener in the 37th minute after beating the Francophone defence with a powerful right foot which caught goalkeeper Raymond Saihuliwa stunned. Just before the halftime break Drudru scored his second goal heading Zibraaz Sahib corner-kick. The Bula Boys were well organised in the first half and displayed structured and attacking football. New Caledonia lifted its game in the second half and played more possession based football, giving the hosts some tough competition. However poor finishing in front of the goal and some scrappy play in midfield and defence let them down. Coach Gamel made some positional changes and introduced youngster Tito Vodowaqa in place of goal-scorer Drudru who got booked for a crude challenge. Dave Radrigai, Malakai Rakula and Nicholas Prasad also made way for Patrick Joseph, Josateki Tamudu and Peni Tuigulagula. Matarerega hammered the final goal of the match in added time after the goalkeeper failed to collect the ball and allowed it to land in Matarerega’s path for an easy tap-in. New Caledonia will now face Mauritius in their next match at 3pm on Thursday at Churchill Park in Lautoka while Fiji will play Mauritius at the same venue on Sunday. Fiji- Beniamino Mateinaqara, Kavaia Rawaqa, Rusiate Matarerega, Zibraaz Sahib, Samuela Drudru (Tito Vodowaqa), Nicholas Prasad, Kishan Sami, Malakai Rakula (Josateki Tamudu), Ame Votoniu, Laisenia Raura (C), Dave Radrigai (Patrick Joseph). New Caledonia- Raymond Saihuliwa, Gaeton Gope-Iwate, Kiam Wanesse (Cedrick Sansot), Joseph Tchacko, Joel Wakanumune (C) (Jean Philippe Sciendi), Romaric Walone, Roy Kayara, Cedric Decoire, Geordy Gony (Mickael Tiaou), Raphael Oiremoin, Nathaniel Hmaen(Nemia Nemia).